simplyasep.com I just cannot close my eyes how happy I am feeling now when I first to know that Indonesia has reached its first Gold medal on the 2018 Asian Games from Taekwondo match. The first Gold medal came from Defia Rosmaniar (23 years old) from Bogor showed her best performance during fighting with the Iranian athletes on Taekwondo women's singles. Indonesia has a goal on this 2018 Asian Games to be among of those Top Ten countries in medal holders during the ASIAN GAMES 2018. 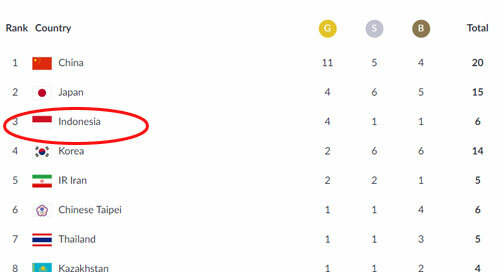 Today, a few minute later, I have got the information from official website of the ASIAN GAMES 2018 that Indoneisa now was in the third rank among those top ten of Gold Holders during the ASIAN GAMES 2018. This is a good sign and I hope Indonesia can keep fighting and collect the GOLD medal as much as they can. I hope so and I know so. The secnd Gold Medal came from Lindswell Kwok Wushu match particularly from from taijiquan number and taijijian all round. This is Indonesia's second gold at the 2018 Asian Games. The next Indonesian gold at the 2018 Asian Games was won by Khoiful Mukhib from the Downhill Putra number Mountain Bike (MTB) branch. In the race held at Khe Bun Hill, Subang, Monday (08/20/2018) afternoon local time, Khoiful Mukhib managed to become the best to win the gold medal in the 2018 Asian Games. The time of 2 minutes 16,687 seconds was inscribed by Khoiful Mukib to win the 2018 Asian Games gold on the Downhill Putra number. He surpassed Chiang Shengshan (Taiwan) and Suebsakun Sukchanya (Thailand). Games.